"Serving Highlands County Since 1947!" Triangle Hardware has been serving Highlands County and the surrounding South Central Florida area proudly since 1947. We are a recognized leader in the community, and for three generations now, the Selph family has provided families, do-it-yourselfers, companies and local home improvement professionals with the best quality hardware, tools, supplies and more – all at unbeatable prices – and all backed with exceptional customer service. We take time to answer questions, explain different options and assist folks properly with all their needs. And much more. In addition, we can special order anything you want. If you don’t see exactly what you need on our shelves, we can order and get it for you quickly. At Triangle Hardware, we are dedicated to providing prompt, courteous service and a higher level of attention and care that folks appreciate. We’re local owned and operated – the same family at the same location for over 60 years. 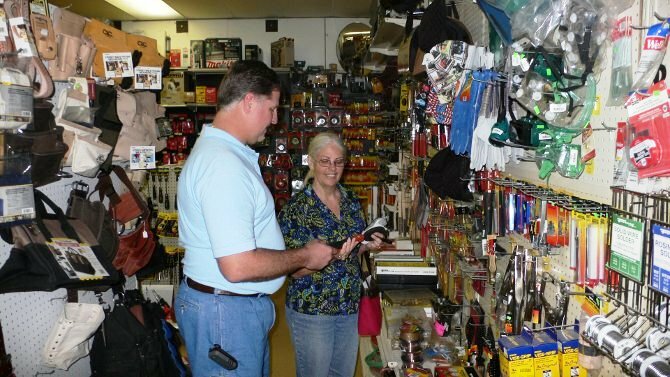 Triangle Hardware is Sebring’s “home town” hardware store – and we invite you to stop by or call us anytime you have a need or question. Our building is a landmark in the area and easy to get to from everywhere. We welcome your business and thank you for giving us the opportunity to serve you. Copyright 2011. Triangle Hardware. All Rights Reserved.